Vegetarian filling enclosed in a tender cold water dumpling dough, boiled garlic chive dumplings are the ultimate in comfort food. Soy sauce, wine vinegar, sesame oil, scallions and sambal combine in a tasty and versatile dipping sauce. Try it with dumplings or spring rolls. RecipeSavants.com Vegetarian filling enclosed in a tender cold water dumpling dough, boiled garlic chive dumplings are the ultimate in comfort food. Soy sauce, wine vinegar, sesame oil, scallions and sambal combine in a tasty and versatile dipping sauce. Try it with dumplings or spring rolls. Smart Recipes, Chinese Recipes, Eggs,Grains Recipes, Recipes Eggs,Grains Chinese Boiled Garlic Chive Dumplings In Cold Water Dough PT20M Serves 12 Ingredients: 2 Bunches Garlic Chives 1 Tablespoon Sambal 3 Ounces Mung Bean Noodles 2 Tablespoons Ginger 1 Cup Re-Hydrated Black Mushrooms 0.5 Cup Thin Soy Sauce 0.5 Tablespoon Salt 1 Egg 1.5 Tablespoons Garlic 4 Tablespoons Sesame Oil 4 Cups All-Purpose Flour 0.5 Teaspoon Salt 1.5 Cups Cold Water 0.33 Cup Rice Wine Vinegar 0.33 Cup Scallions For The Dough Wrappers: In a stainless-steel bowl, mix together flour and salt. Slowly add cold water 1/4 cup at a time and with chopsticks, mix till a ball is formed. Place dough ball onto a floured surface and with your hands, knead until smooth and elastic. Return dough into the bowl and with a damp cloth, cover it. keep aside for at least 1 hour. Place dough onto a floured surface and with floured hands, roll out dough into 1-inch in diameter long rope. Cut rope into 1/2-inch pieces and turn them over so cut sides are facing up. With your palm, flatten each dough piece and then with rolling pin, roll into a 3-inch diameter thin circle. For The Filling: In a large bowl, add noodles, chives, mushrooms, garlic, ginger, 2 tablespoons of soy sauce, 3 tablespoons of sesame oil, egg and salt and with your hands, mix till well combined. For The Dumplings: Place a small amount of filling mixture in the center of each wrapper. Fold each wrapper in half to form a half moon shape. Starting on one end, pinch the wrapper tightly together. In a large pan of salted boiling water, add dumplings and cook for about 3-4 minutes, stirring gently. For The Dipping Sauce: In a small bowl, add scallions, 1/3 cup of soy sauce, vinegar, sambal and 1 teaspoon of sesame oil and mix well. 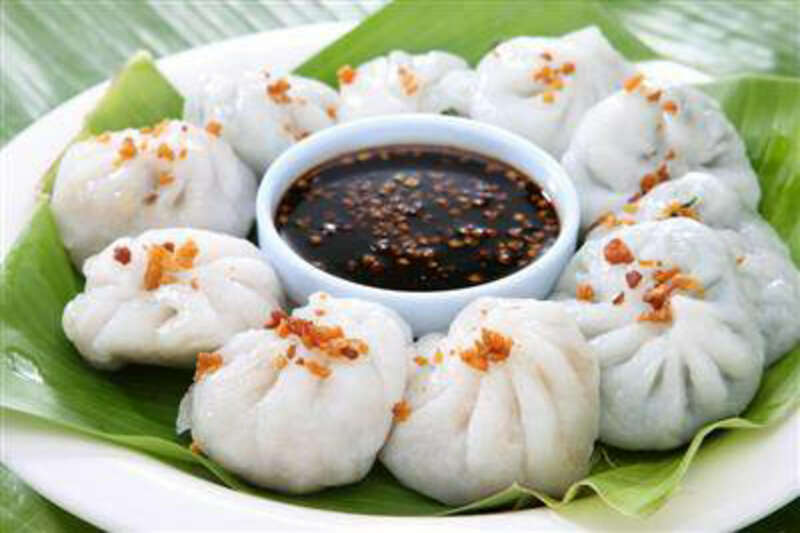 Transfer dumplings to a large platter lined with lettuce and serve with the dipping sauce alongside.